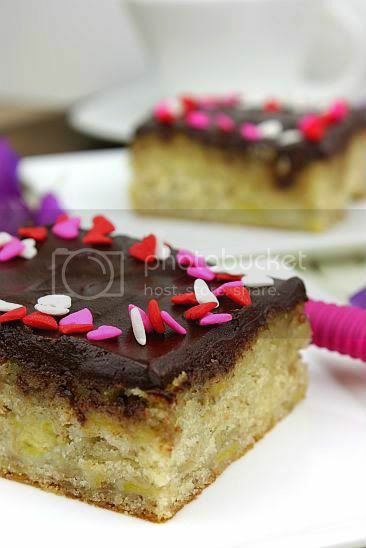 Who could say no to a banana cake with chocolate frosting? I think most of us would not pass this on and it was not surprising that it was a favourite vote for this month's baking challenge with the Cake Slice group. For me a good banana cake uses very ripe bananas and nothing beats using the local Malaysian type which is called "pisang emas". Translated this means golden bananas. They are small and when ripe, are extremely, extremely sweet and flavourful. I had asked my hubby to buy a ripe bunch for me so that I could tackle the cake over Saturday. Unfortunately he bought one that was hardly ripe at all - it was still very green. So to ripen it, he left it hanging outside in the yard and that forced me to push my baking schedule to Sunday instead. Luckily by Sunday it was more or less ripe and I was able to use the fruit after all. I halfed the recipe and baked it in a rectangle cake pan, thus achieving a slice cake version. In fact that had been my intention from the beginning. However I omitted using the chocolate frosting that came with the original recipe. I had some left over sour cream chocolate fudge frosting from another cake and I used the remaining of this frosting instead. Overall the cake was pretty nice and extremely soft. 1) Heat the oven to 350F. Grease and flour two 9 inch cake pans. Combine the flour, baking soda, baking powder and salt in a medium bowl and stir with a fork to combine well. 2) In a large bowl, combine the butter and sugar and beat well, about 2 minutes. Add the eggs, one by one, and then the vanilla. Beat well for 2 to 3 minutes, scraping down the bowl occasionally until you have a smooth batter. 3) Using a large spoon, stir in half the flour just until it disappears into the batter. Stir in the buttermilk and then the remaining flour the same way. Quickly and gently fold in the mashed banana and then divide the batter between the 2 cake pans. 4) Bake at 350F for 25 to 30 minutes until the cakes are golden brown, spring back when touched lightly in the centre, and begin to pull away from the sides of the pan. 5) Cool for 10 minutes in the pans on wire racks. Then turn out onto the racks to cool completely. 6) To make the frosting, combine the butter, cocoa and evaporated milk in a medium saucepan. Place over medium heat and bring to a gentle boil. Cook, stirring often for about 5 minutes, until the cocoa dissolves into a dark shiny essence. Remove from the heat and stir in the confectioners sugar and vanilla. Beat with a mixer at low speed until you have a thick smooth frosting. 7) To complete the cake, place one layer, top side down, on a cake plate and spread about 1 cup of frosting evenly over the top. Cover with the second layer placed top side up. Spread the rest of the frosting evenly first over the sides and then covering the top of the cake. so cute! nice going with the chocolate sour cream frosting...the frosting that went with this recipe was a bit troublesome. Your cakes are so cute and elegant in little squares. Love the sound of the super sweet mini bananas - yum. You have made a simple banana cake so much more appealling! Ciao ! I love your square version !! I a pastry class I took they 'cooked' the whole bananas in a very low oven In a pastry shop it is more secure to get the same results ! You are so lucky to have bananas as a local food! That is so cool! My mom had a banana tree when I was growing up and they were so tasty! Your cake looks so cute with the decorations! Very cute cake...makes me want to bake this all over again! 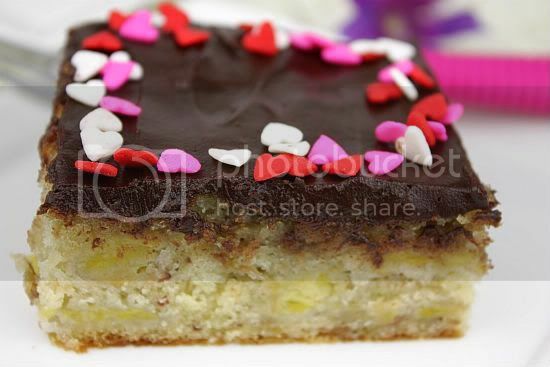 Your banana cake sounds and looks delicious!! I love to have a piece with my morning tea!! Your slice of cake came out perfect. Your frosting sounds delicious too! Banana cake is my favourite but had never had it with chocolate icing on top. Looks gorgeous and delicious. It looks really good. wish I had a piece right now! The banana cake became so extraordinary with the chocolate frosting. Neat and elegant! The colorful heart bits just make this cake so outstanding! 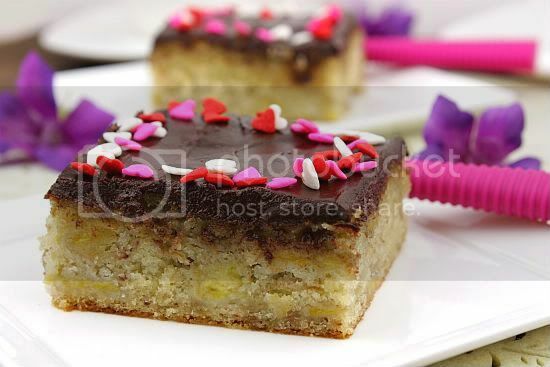 What a tasty & apart looking banana cake & I so love the little coloured harts on top of the frosting!! 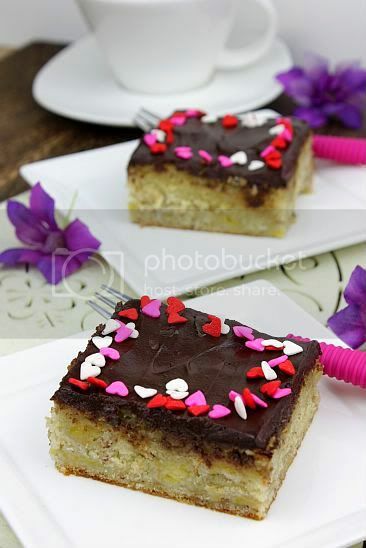 Your cake squares look gorgeous! it looks cute andit has a delightful taste to it. The icing i love it so sweet and chocolatey. Its a must have recipe for me. Ienjoyed it and so didi the family and freinds.